In a nation wholly obsessed with prosciutto, how do you go about finding the best that money can buy? For that you’ll need to head to the comune of San Daniele del Friuli – a town made famous by a history of melt-in-the-mouth ham. Most of us have eaten a slice of prosciutto at some point in our lives. Cured Italian hams have long been available to the masses in the UK and beyond – supermarkets offer multiple a wide range of different hams these days, and they’ll even turn in up your run-of-the-mill lunchtime sandwich if you let them – but like so many artisan products, there exists a spectrum of quality that we don’t often consider. 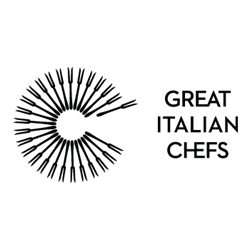 When it comes to who make the best prosciutto crudo in Italy, there are normally two suitors to the crown – Prosciutto di Parma (commonly known as Parma ham) form Emilia Romagna and Prosciutto di San Daniele from the region of Friuli Venezia Giulia. Whilst your average leg of cured ham is made using roughly the same process as these two speciality hams, Parma and San Daniele ham are both DOP-protected, meaning that they must be made via very specific traditional rules and regulations. There are lots of other DOP-protected hams of course, but those made in Parma and San Daniele are certainly the most popular and generally regarded as the highest quality. Whilst Parma ham is made in quite large quantities and over the significant geographical area of Parma to support demand in Italy and abroad, San Daniele is made in much smaller volume – there are around six times as many producers of Prosciutto di Parma as there are of San Daniele, and the latter is only made in the 8,000-strong town of San Daniele itself. But it isn’t just exclusivity that makes San Daniele the king of prosciutti. Like most cured hams, this salumi is only made with the legs of Italian pigs and sea salt – there are no extra flavours added and only traditional curing methods are used. You would think then that all prosciutto would taste the same, but there are lots of reasons why this isn’t the case. Different breeds of pigs will naturally taste different, but their diet also has an effect on flavour and that effect becomes particularly pronounced when the water content is drawn out of the meat through curing. Pigs in San Daniele feed on a diet of whey and high-quality grain, roaming in the dry air of the Dolomite foothills – factors that combine to make Prosciutto di San Daniele DOP particularly sweet and aromatic compared to other prosciutti. 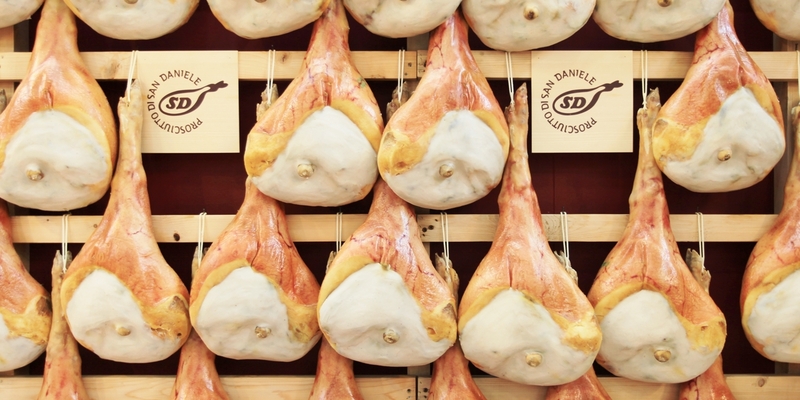 San Daniele ham has been an integral part of the town’s identity for many centuries now. As far back as 1453, physician Geremia Simeoni noted that lean meat from the local pigs could be preserved with salt and eaten, and the hams made in San Daniele were clearly prized from then on. When Napoleon invaded Italy at the end of the eighteenth century, his lieutenants supposedly looted vast numbers of the hams from the town on their way through the country – regarding them as a valuable delicacy. There’s something reassuring about the idea that the Prosciutto di San Daniele DOP we eat today has been made in exactly the same way as it was over 500 years ago. Once the legs pass an initial quality check, they’re left to firm up in a fridge or cold place for twenty-four hours before being salted, hung and then pressed. This pressing allows the salt to penetrate, and gives San Daniele hams their characteristic guitar shape. After a maturation period that lasts at least thirteen months, the exposed surface of the meat is smeared with a paste of lard and flour – called ‘sugna’ – to stop it drying out, and the ham undergoes regular testing to check on its progress. Two types of tests are carried out: producers carefully strike the leg to check the firmness of the ham, before pricking it with a needle to check the aromas within. San Daniele is typically ready to eat after eighteen to twenty months, by which point it has developed a complex network of flavours and aromas. Good Prosciutto di San Daniele DOP should have a pinkish red hue with blank white fat when sliced – any yellow tones are a sign that the ham may not have been stored properly. In Friuli, San Daniele is often served on its own – this is the best way to appreciate the nuanced sweetness of the ham, which develops toasty flavours of malt and bread as it ages, alongside the younger fruity aromas – but it also works wonderfully with sweet fruits like melon and fig, creamy cheeses like mozzarella and burrata, or with a freshly baked focaccia. Search out Prosciutto di San Daniele DOP in your nearest Italian delicatessen, or even better, go on your own pilgrimage to Friuli and discover the real deal for yourself!